The air outside Boise’s Neurolux was crisp and full of fans reminiscing on the recent acoustic session at the neighboring Record Exchange. Filing in, the long dark venue quickly took on standing room only. Jon Snodgrass took to the stage to open what would be an incredibly memorable evening. His solo, creative set was one most will not forget. Following in order, Milwaukee’s Dead Horses surprised the crowd with an immensely entertaining performance. Not only did they deviate from cheese references and slight-Canadian accents, their repertoire was stunning. As the great bearded one and accompanying bass and drums took to the stage, the atmosphere became electric. The ensuing storytelling webs woven from atop the elevated stage would leave the crowed entranced in a voice that is sometimes Cat Stevens, sometimes Sam Elliott. The technicolor Obi-Wan, sans the technicolor emitted a larger-than-life presence while he played out songs, often in the accompaniment of the crowd word-for-word, on his acoustic. Playing his familiar songs such as “The Whistler” and “Wish It Was True,” even evoking his inner Kristofferson/Cash/Jennings/Nelson with a memorable (and this is an understatement) rendition of “Highwayman,” the prophetic aura of The White Buffalo fell somewhere between aggressively passionate and reflectively compassionate. The presence of Jake Smith, et al, turned even the manliest of men present that evening into awe-struck, nearly swooning fans. Conversations of “I saw him when…” or “he opened for…” became hushed and replaced with cheers. His humble, powerful stage presence delivered, even somewhat tight confines of the Neurolux, a monumental performance that was ever-expansive. The deeply rooted southern rock stylings gave way to a singer/songwriter of the highest caliber. The blend of new, old, and original painted the faces of those in attendance squarely into the glow of stage lights. Though the night began to mixed reviews of those present, by the end, as the crowd shuffled through the door, passed the fogged up glass into the Boise night, there was no doubt the performance witnessed would be memorable. The ringing ears and hushed footsteps were broken only by remarks of “that was amazing” and the like. Six hours after the Record Exchange in-store performance, The White Buffalo performance became a memory. 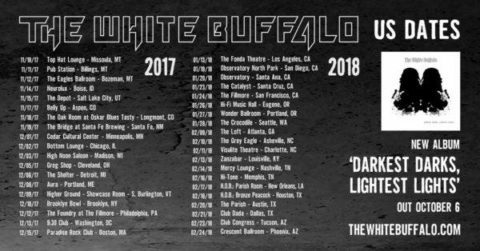 This entry was posted in Interviews & Live Events and tagged Boise, concert, Idaho, Live, music, Neurolux, Tour, White Buffalo by Greg. Bookmark the permalink.